Lesson 1: Stand fearless, fear is the biggest disability. The fear of what people will say or think of you, fear of your future, fear of the past, fear of the failure and fear of being judged will kill you from the inside. Nick overcame these fears and lives his life as a happy free young man. Despite being born without limbs, Nick Vujicic always stood fearless in each step that he has taken in his life. Being an author, CEO, speaker, degree holder in financial planning and accounts, his physical limitation never stopped him from achieving much more than an average fully developed human being. Lesson 2: Believe in God. “If you believe in God, you will have the hope”. According to Nick, God is the source of hope in your life and when you have hope, you will have the strength to stand again and finish strong. Being harassed during school, he contemplated and even tried to commit suicide when he was only 8 years of age. For years, he continuously asked himself, why he is not like the children around him and why he is the only one without arms and legs. He wondered what the reason for his life was, or if is there any reason for him to continue living. Nick says you need to wait for the right time for things to change for the better. He says that God is the best planner for He always has better plans for you. Even if you cannot find any hope, you must decide to stay and keep hoping for the best. Lesson 3: There are no excuses for achievements. Nick Vujicic always had the correct outlook towards life. He knew that he has born with neither arms nor legs but he was happy with what he had. He always dreamt about living his life like others around him. Despite suffering from his severe disability, he tried to accomplish unbelievable tasks every day. He stayed focus and learned to accomplish them without any external help. Nick Vujicic became the first person to be integrated into the Australian School System. He can do all daily activities by himself. He can do swimming, fishing, surfing, skydiving, snowboarding, and even play golf. He is a successful entrepreneur with a networth of approximately USD 500,000. In 2010, He was awarded the best actor for his role in a short film, “The Butterfly Circus”. Lesson 4: Everything happens for a reason. Nick always thought that he was a burden to the family, until he met a boy with no arms and legs and Nick immediately thought he could perhaps be of help to him. Nick understood that life has a certain purpose for everyone and that he just found the purpose of his life. He realized that he can be an inspiration to everybody, especially to the ones who are like him. He believes that there is a purpose for which you have been thrown into the fire to burn, today it may not be visible to us but in the later stages of life we may come to know that everything that has happened in the past happened for a reason. He now discovered the answer to why he was born without limbs. God made it happen to him so that someday he can become what he is now and inspire others to do better. Nick loves to tell his life stories to everybody. During earlier stages of his life, he used to be a very shy person till an Indian Janitor in high school motivated him to speak out, face people, hold talks and indulge in discussions. Nick tells everybody that despite having so many limitations, if he can be thankful to God for a joyful life then all others can also be. They don’t need to be sad about their life. Everyone can be a inspiration to others if they choose the right attitude towards the life. Nick loves his family for he knows whatsoever the case may be, his family has always stood by him in his ups and downs. His parents accepted him as a normal child, sent him to a normal school and allowed him to face the world as a normal human being. His wife stood beside him when he was faced with dire financial crisis in his business. Now he is a proud father of two sons. He believes that family teaches you to be responsible and sincere towards your life. Without family, life is incomplete. Family gives you a reason to smile, even during the hardest of times. Lesson 7: You can always achieve more. 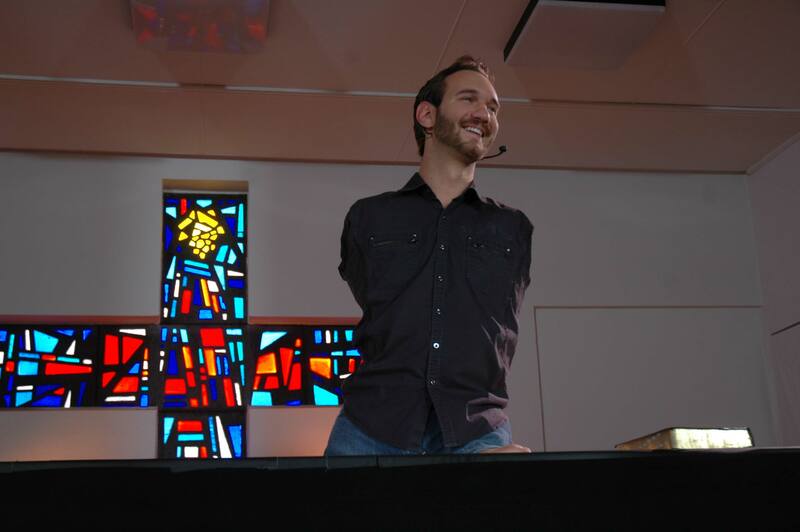 Nick Vujicic inspires us to get most out of the life. If you believe that life is short and futile, Nick will prove you wrong and put to rest every excuse that can stop you for achieving your goals in your life. Everything depends how do you use your time to win everything you want. Whatever he has accomplished till now is due to his zeal, resilience, persistence, training and right attitude. But Nick doesn’t stop here and as a motivational speaker, he still looks forward to motivate and inspire many more people in the world. Women- Why Are They Held Back? How To Deal With An Eating Disorder? HOW WOULD YOU PLAN YOUR BACHELOR PARTY AT THE BARS?